Setting up a group can be done in just a few simple steps. After allowing NYNJA to access device's location, users can choose whether they want to send starred, recent or current location by clicking send location.To share a location, users can simply choose the contact they want to share a location with, open the wheel, click actions and then choose location. 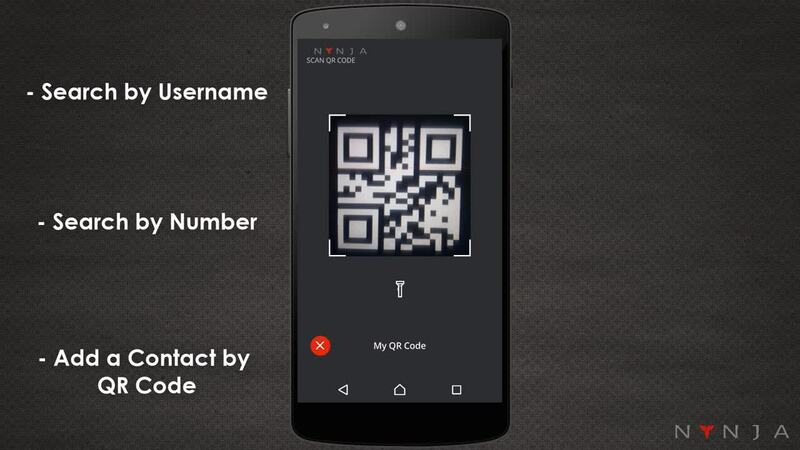 NYNJA supports conference calls for up to 100 people completely free and with no limitations on the length of the call. Voice messages can be translated in two simple steps - transcription and translation. Press the voice message bubble for one second and then press transcribe. The message will appear with remarkable accuracy underneath the original voice message. To translate it press the transcription bubble and choose to translate with Google. Hint: To perform translations between multiple languages, you might need to update the language settings. With NYNJA, you can break down the language barriers in your conversations with foreigners, in your travels, holidays... or just to practice a language. To quickly translate text messages, enter a recipient profile and go to language settings. Choose the language and turn on auto-translate on receipt. All your future messages with the recipient will be instantly translated.